Since moving to the American Southwest four years ago, Lisa Molomot has been exploring stories about immigration in her documentaries. These recent works involve migrant workers in Arizona, an interior immigration checkpoint in Texas, and an asylum seeker from Honduras who ends up at the Eloy Detention Center in Arizona. Lisa is also collaborating with Dr. Alison Mountz on a feature documentary, filmed in British Columbia, Ontario, Colorado and Arizona, about U.S. war resisters who came to Canada in search of safe haven during the Vietnam and Iraq wars. 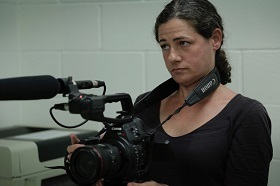 In her talk, Lisa will share her experiences of and challenges relating to access and ethics in making documentaries in the age of Trump, and will screen short clips of her films.